One of two stories. I might leave Arthur ‘Neddie’ Smiths story for another time in the future…..a very long time in the future. Other story. Fairly certain it was a Sunday night, and while having a game of snooker in the meal room at Pyrmont, with Brian Mackinlay, (rip), a call was received. Headed out with all lights off down to a back lane in Pyrmont. I am fairly certain it was Paternoster Row. We pulled up and crept up to the house on the corner. We took little interest in the tailights disappearing in the distance. As we were about to kick the door in, an old woman opens it and says, “too bad boys, Mad Dog left here 30 seconds ago”. Seems the tailights were that of the car which housed Russell ‘Mad dog‘ Cox, as he had been holed up in this particular house for 4 days before someone dobbed him in, and we were 30 seconds late in grabbing him. 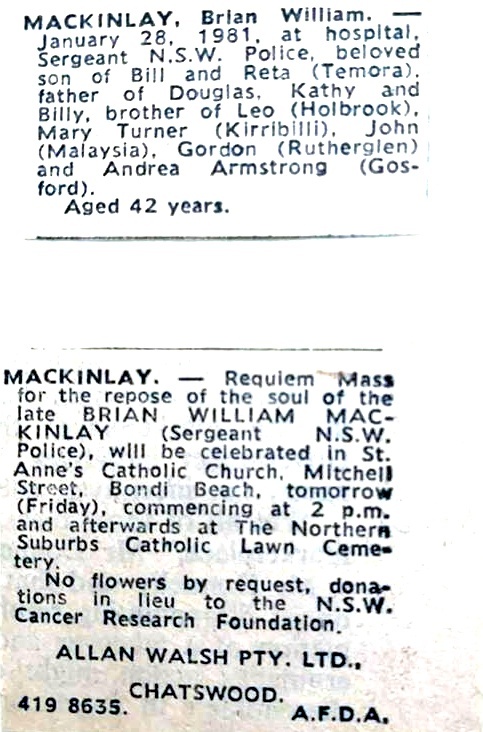 Brian MacKinlay was stationed at Vaucluse under Sgt.Jim Napier in 1973 as was my late husband Leslie Burroughs. I vaguely recall there was mention of melanoma and that he lost either a portion of his leg or his whole leg to the cancer. Sorry I cannot confirm these details as I don’t know if anyone else who was at Vaucluse is still alive or their whereaboujts.